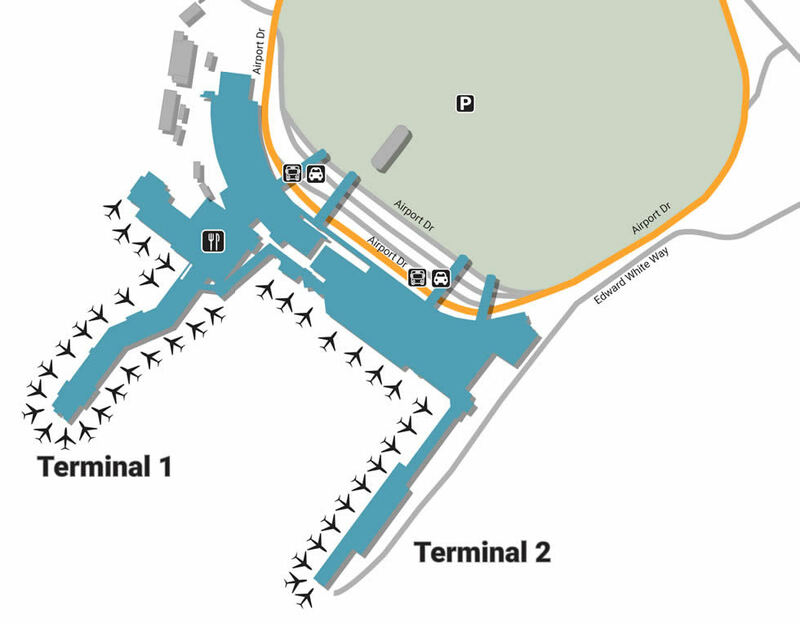 Getting through the terminals at Oakland International Airport can be easier with our maps of the terminals. You can find your way around the airport and get to your destination quickly. Located east of San Francisco, the sunny city of Oakland is a top-notch town with friendly faces as well as amazing food. Oakland International is a great reflection of the city, especially since it’s one of the highest-rated airports in the country. Offering guests unique amenities alongside an easy-to-understand layout, the airport is located 10 miles south of downtown, satisfying every craving, whether it be the hunger from a delay or the need to do something with idle hands. The diverse parking options at Oakland International make the hard part of trips easy. The most convenient is Premier Parking, which offers hourly and daily rates. Premiere Parking is located off Airport Drive in front of Terminals 1 and 2. Those planning on staying for only a few hours should utilize Hourly Parking, located right behind Premiere Parking. For daily parking, head to the Daily Lot, also located off Airport Drive. Those planning a long-term trip should head to the low-fare Economy Lot, located off John Glenn Drive near Terminal 1. From interesting spaces that help you forget the chaos to simple pleasures that ease anxiety, Oakland International leaves the perfect first impression for stressed-out travelers. From the relaxing Escape Lounge that’s open to all passengers to the bright and colorful mamava lactation pods located in pre as well as post-security, any and everything is available. There are also handicap-accessible ramps as well as complimentary wheelchairs available at guest services, not to mention a strong Wi-Fi network in every terminal. Make a couple hours go by quickly by spending some time in one of the many shops throughout every terminal. Pick up local headlines at Terminal 1 newsstands, which include the Oakland Tribune by Gate 5 as well as Lake Merritt News near Gate 15. Grab some shades at Sunglass Icon, located at Terminal 2’s Gate 29, or continue exploring Terminal 2’s other goodies, whether it be the newest electronics from InMotion Entertainment (Gate 25) or the boxed chocolates and imported wines at Oakland Marketplace (Gate 28). Grab some tasty coffee as soon as you step off your morning flight, enjoying the flavors of one of the four Starbucks scattered across both terminals. You can also grab a specialty roast at Firewood Cafe (Terminal 2, Gate 23), or Peet’s Coffee (Gate 28). If you’ve got several hours to kill and nothing to do, grab a few drinks at 8 bar, located in Terminal 1’s food court near Gate 8. While you’re there, grab some fresh Chinese at Gate 9’s Silver Dragon. If you’re in the mood for a familiar snack, eat some roasted weenies wrapped in salty bread at Auntie Anne’s Pretzels (Terminal 2, Gate 26). If you’re more in the mood for a sit-down restaurant, stay in Terminal 2 and enjoy happy hour at Gate 28’s Andalé.